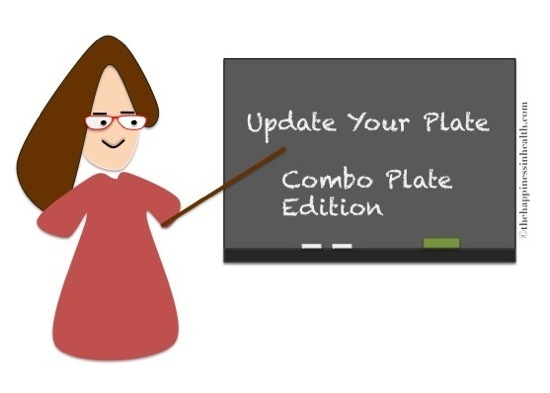 This post is a continuation of the Update Your Plate series, where I demonstrate how to use MyPlate to plan your meals. Read the story behind Update Your Plate here. Ever since I decreased my posts from six times per week to three times per week, I’ve skipped THIH’s weekly Monday Munchies (the series where I document everything I eat over the course of a single day) and Update Your Plates. 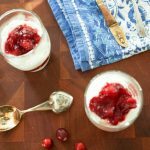 I’ll likely continue the trend of posting MMs and UYPs only occasionally in the interest of having more variety – and more fun recipes! I purposely laid out this plate to reflect how many people fill their plates: foods tossed together, rather than laid out like a perfect MyPlate. 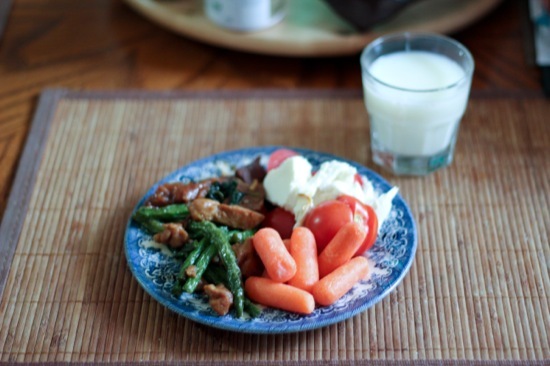 Clockwise from lower right: Carrots, leftover green beans and chicken from Golden Harbor over brown rice, tomato and mozzarella salad. The idea behind MyPlate is by filling your plate with foods in the proportions suggested, you’ll eat plenty of nutrient-packed fruits and veggies and a moderate amount of protein and grain-based carbohydrate. And without measuring! Note that, as usual, I’m eating from a 9-inch dinner plate and not from, say, an enormous 16-inch serving platter. 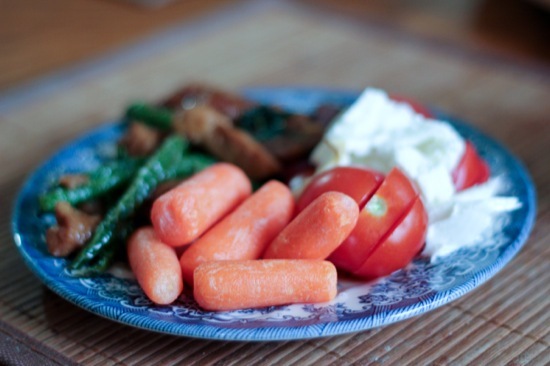 I also group fruits and vegetables together because we tend to eat either one or the other at meals (e.g. fruit at breakfast, veggies at dinner). How does our combo plate look? 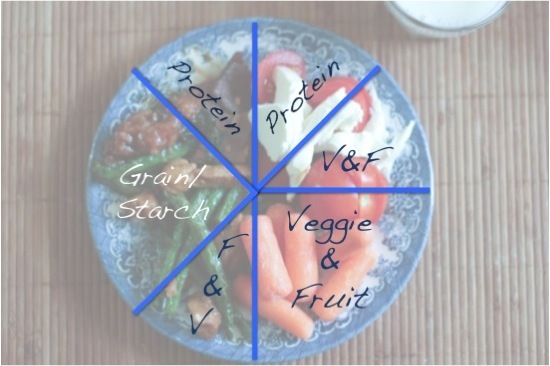 Let’s just call this the MyPlate Pie Chart of Insanity. Breaking it down: Carrots belong to the Fruits & Veggies section, while the Golden Harbor leftovers (taking up 1/2 the plate) are divided into 1/4 Fruits & Veggies, 1/2 Grain, and 1/4 Protein. Why did I divide the leftovers that way? By now I’ve become quite good at estimating proportions of different foods. When I serve myself, I make sure I’m getting enough whole grains (1/4 of the plate) and protein (1/4 of the whole plate). 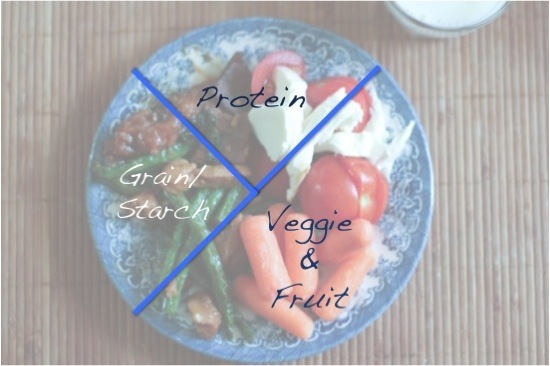 In the beginning, when I had difficulty visualizing this, I practiced by filling my plates in a way that more closely matched MyPlate. See this post and this post for examples. Finally, the quarter of the plate with tomato & mozzarella salad is divided into Fruits & Veggies and Protein. You may notice a discrepancy between my plate and MyPlate. Just as with this post‘s yogurt, I have assigned cheese to the Protein category instead of the Dairy category. Cheese and yogurt are too high in protein NOT to count for that group, particularly as I enjoyed this meal with a glass of skim milk. Ounce for ounce, cheese and meat are similar in protein content (about 7 grams per ounce). Let’s hear it for variety! See what I did there? You’re welcome. Q: Do you separate foods on your plate or jumble them together? I’m definitely a separator! It’s rare, however, that my plate looks like “My Plate”, as our meals are typically casseroles and stir fries and stuff like that. I love how you draw the lines on your plates to show as a visual. I am still obsessed with that! It really depends on what I’m eating. I am a fan of the rice bowl approach to meals- have a grain, veggies and protein all in one meal. (Sometimes dairy too). But with other meals, I might separate things a lot more, either by using a big plate or even using a smaller plate and a bowl to keep things separate. Lately I’ve been eating a lot of soup meals, so I’ll have a bowl of soup and then have a salad on the side, or something along those lines. I try to have a good mix (but I know I don’t eat enough dairy!). I like to put everything in a bowl, too – it’s just easier to demonstrate the plate when I spread everything out 🙂 I should keep the one-bowl meal in mind for the next post – thanks for the idea! 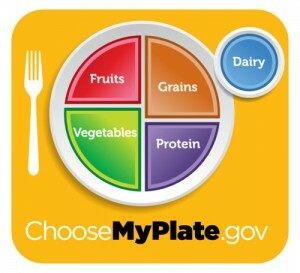 Although myplate is simple to follow there is a lot of gray areas. I mix a lot of my foods so it is good to see how it is laid out. I’m more of a jumbler but it really depends on my mood and the food in question. 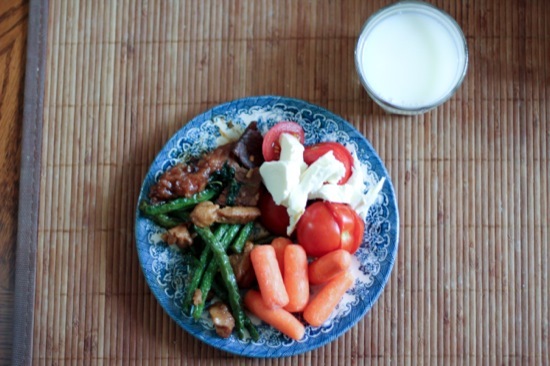 I love how you show real life ways to stick to the MyPlate model! I once was obsessed with keeping foods separate (as a child) but now I’m all about mixing! Thank you for sharing with us. I hope you have a great start to your week. Stay healthy, happy, and warm!